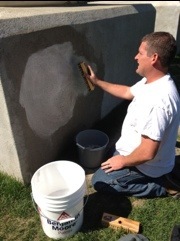 MU maintenance painter, Brian Hanlon, washes off graffiti on the far left column late Wednesday morning. Brian Hanlon from campus facilities was sent in around 11 a.m. Wednesday, April 11 to clean graffiti off of one of the MU Columns. “It looked like the name ‘Alec’ was written in red lipstick or wax crayon,” Hanlon said. Hanlon did not know when the incident occurred or who was responsible for the vandalism, but suspects he was called in not long after the graffiti was discovered. Fortunately, the writing washed off fairly quickly. 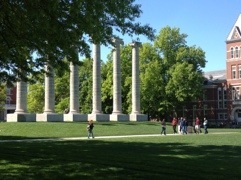 Hanlon finished up right in time for a tour group to pass by and admire the historic columns. A tour group of prospective MU students pass by a faint wet spot on the left column only a few minutes after Hanlon scrubbed off the graffiti. Graffiti on the columns is not a common sight, however, there have been some more extreme cases of vandalism at this symbolic sight in the past. In April 2000, the letters “iBONO” were spray-painted on each of the columns. Last March, a drawing made of mud that read “Love is the Message” was also found on one of the columns.